Whether you are a new graduate or a seasoned professional, you understand and value the importance of continuing education in this profession. Medbridge Education and the Medbridge certificate programs are both great places to find affordable online continuing education credits. As a relatively new grad, however, you may not have extra finances for continuing education classes and resources. You may also be short on time or means to travel to far away locations for continuing education. MedBridge also offers animated videos and 3D models for patient education, as well as the feature to design your own patient specific home exercise program. For home exercise programs, Medbridge Education has an innovative mobile app (for both Apple and Android) where patients can access their home programs and follow along to exercise videos. Interested in advancing your knowledge? Adding to your resume? Potentially earning more money at work? A little-known fact: There are seven MedBridge certificate programs to advance your professional skills and expertise! The MedBridge certificate programs, along with all other available continuing education credits, offer high quality, interactive ways to better your practice. Case studies are included in all courses and handouts/course material is often available to add to your practice. Quizzes follow each chapter to test your knowledge. More importantly, courses are taught by experienced professionals with vast expertise and knowledge. Contact information for instructors is available if users have questions. Continue reading for a brief overview of each certificate program and for help discerning which certificate program may be the best for you. The Orthopedic Excellence: The Upper Quarter certificate program is great for individuals wanting to learn more about the evaluation and treatment of orthopedic-related shoulder, elbow, wrist, and hand injuries. This program made me feel more confident in understanding and managing the upper extremity related issues I was seeing in my practice. The courses in this program strengthen your clinical decision making and expand your knowledge of several intervention methods. The program allows for “break out” sessions for hands-on practice of recently learned material. 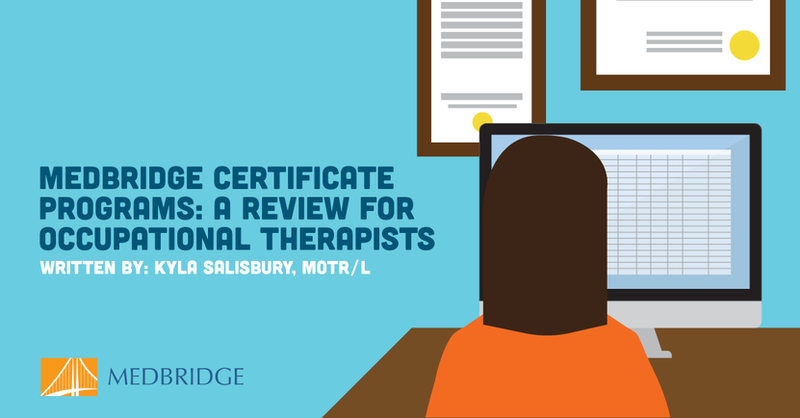 There is an enormous amount of advanced and valuable material in this certificate program for occupational therapists working with upper extremity issues. This certificate program is composed of six courses and takes approximately 25+ hours to complete. The Dementia and the Capacity for Learning certificate program is next on my personal list to complete! Statistics from the American Alzheimer’s Association (2017) estimates more than 5.5 million Americans are currently living with Alzheimer’s and that one in 10 people age 65 and older has dementia. For any therapists working in acute care, inpatient rehabilitation, outpatient rehabilitation, home health, skilled nursing, or long-term care, this course is for you. It appears to radiate a wealth of occupational therapy related content for the treatment of dementia. Education regarding helpful low and high assistive technology is also a large component. The course also includes best practice for behavior management, improved communication, and enhanced quality of life for both the patient and caregiver. This certificate program is five courses and takes approximately 15 hours to complete. The Modern Athletic Science of Returning the Injured Athlete to Sports focuses on overuse injuries. This program may best suit sports health and outpatient rehabilitation therapists. The program discusses a multifaceted approach to returning injured individuals and athletes to the occupations they need and love to do. You will learn manual therapy, neuromuscular training, and strength training in lecture material that is combined with live patient cases to keep your interest. Course content will review etiology of injuries head to toe: overhead shoulder injuries, trunk and hips, knees, and even the over or under pronated foot. Content will also increase your understanding of proprioception’s role in upper and lower extremity movement, and the difference in muscle fiber types for strength, power, and endurance. It is a great weapon in your arsenal for appropriate and effective interventions and exercises for the treatment of several overuse injuries. This certificate program is six courses in length and takes approximately 15 hours to complete. As a five-course series, the Healthcare Ethics, Law, Management, and Policy Series certificate program covers the ins and outs related to healthcare law, management, and administration. Medbridge Education suggests this program may be best for management or for clinicians responsible for their own practice. However, as a new graduate, this course is helpful for better understanding the paperwork and policies that largely impact treatment we provide. Decision making, malpractice, documentation, HIPPA, and reimbursement, are reviewed in this course along with several other important topics. Certification is earned from 16 hours of courses. Post-concussion syndrome and mild traumatic brain injuries seem to be increasing in health discussion in recent years. The Concussion: Assessment and Medical Management certificate covers this in detail for newly minted occupational therapists. OTs have a crucial role in managing care for those with concussions and mild TBIs in the acute care setting. The increased awareness may be due to increased blast injuries in war-related incidents or the increased knowledge and identification of concussions in sports-related accidents. For this reason, if you feel you may see individuals in your setting with concussion symptoms, this certificate program is for you. Learn which subtype, or combination of subtypes, drive symptoms and how to help treat these symptoms in a multidisciplinary approach. Understand what symptoms present as “red flags” and when to refer to other disciplines. Out of all the MedBridge certificate programs, this one is exceptionally helpful for understanding normal and abnormal oculomotor and visual findings. It has helped me personally by expanding my knowledge of vestibular conditions such as benign paroxysmal positional vertigo. This certificate program is composed of four courses takes approximately 12 hours to complete. With a focus on the lower extremities (pelvis, hips, thigh, knee, ankle, and foot) the Orthopedic Excellence: The Lower Quarter course may best suit physical therapy or athletic training. Course content on advanced technical concepts helps strengthen skills sets and improve patient outcomes. Hands-on practice packets are included to facilitate learning. This certificate program is composed of nine courses and takes approximately 38+ hours to complete. The MedBridge certificate program, Orthopedic Excellence: The Spine, is best for those who are evaluating and treating cervical, thoracic, and lumbar spinal conditions. It is applicable and helpful to occupational therapists in a couple ways. First, it may help occupational therapists recognize the different signs and symptoms of a shoulder-related injury compared to an injury originating in the cervical spine. Second, with the high prevalence of back injuries, this program may be helpful for occupational therapists working in return to work programs or for those evaluating and making recommendations on ergonomics or workplace/home modifications. Seven courses comprise this certificate program, taking approximately 33+ hours to complete.